It seems like just a short while ago that we moved into our home in Pembroke. It’s crazy to think we’ve been here for four months already and now into a new season! Halloween is just around the corner and the preparations have begun in our home. My daughter has her costume and the fall decor is coming out of the boxes. I need to buy some Halloween candy for the trick or treaters and am noticing Halloween programming and advertisements on the sites we frequent. Both my girls are like me and love the Halloween themed shows. For me, the scarier the better! With a 10 year old girl, however, I need to pick shows that are more age-appropriate. One movie I remember watching every year as a child is “It’s the Great Pumpkin, Charlie Brown”. We didn’t have cable or satellite when we were living in Nova Scotia so I haven’t watched it in long time. Now that we have satellite TV again I’m going to look for it in the TV listings! I think it would be fun for Bridget to watch a show that mommy watched as a young girl. Bridget is already looking forward to it after painting her nails with the brand new Peanuts by OPI collection. This collection is based on Charles M. Schulz’s comic strip characters and was inspired by the movie, “It’s the Great Pumpkin, Charlie Brown”. It features four fun shades including a cheery yellow, chic black crème and two black-based glitters. What do you think of the colours? I can see why they picked them looking at the comic strip especially the yellow. It’s the same colour as Charlie Brown’s shirt. With this collection, OPI wanted to celebrate the fun youthful nature of the Peanuts characters and capture the spirit of Halloween. I wear a lot of black so that’s the first colour I was immediately drawn to. Then I thought why not try something different? I’ve been wearing the yellow shade- Good Grief!- lately. It’s happy and bright and also eye-catching! I’ve had a few people ask me what shade it was. You can also find all four shades in the Little Peanuts mini pack. It comes with ten nail decals with fun sketches and popular phrases to add some playful nail art. The mini pack has an SRP of $17.50. 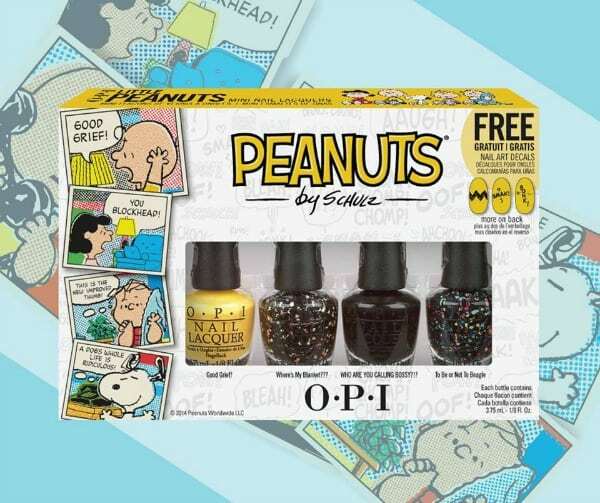 You can find both the Peanuts by OPI collection and the Little Peanuts mini pack in professional spas and salons across the country. The Peanuts lacquers retail for $11.50 each. Which one is your favourite? 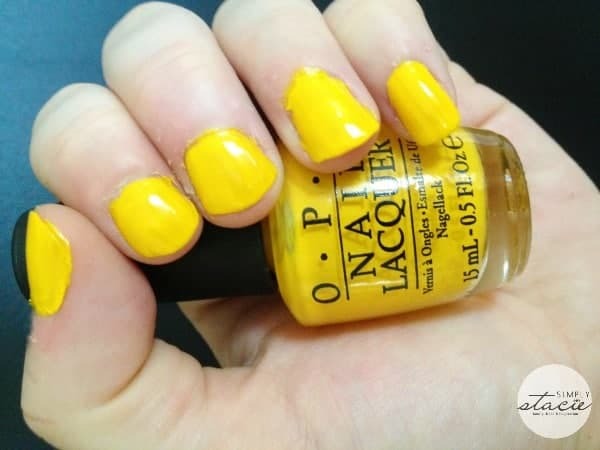 Enter my giveaway to win the Peanuts by OPI collection! What a cute gift for a tween! I know my niece would love to have the nail colors. I like the yellow but I’m not sure I would wear it myself or the glittering stuff. I know the kids love stuff like this so I surely will look in to it if my grand daughter likes it. Thanks for sharing the post. what a great imagination OPI has, to keep coming up with fantastic colours and names for the colours, incredible. Love the collaboration!! Great sharp Fall colors to combine with this year’s Fall fashions. Winner! Very cute, I love the yellow shade!! So cute! I love OPI’s “themed” sets, this one is a lot of fun! I don’t usually paint my nails, but this looks like a really fun collection. What a cute idea! 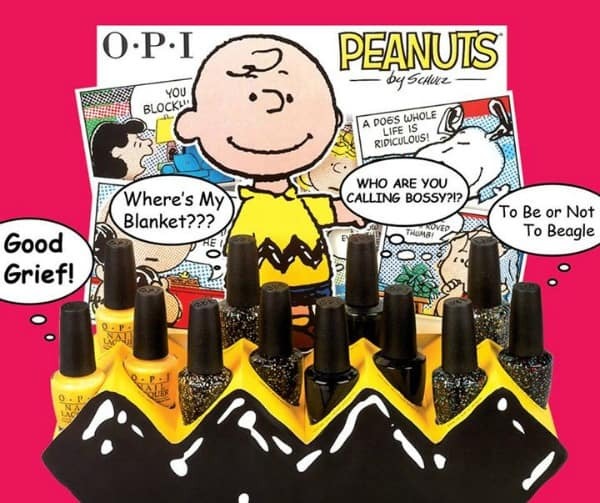 The Peanuts collection from Opi has different names from peanuts and the colors. I think that this is such a cute idea!! I love the bright color of yellow! It was my grandma’s favorite color to wear and it makes me smile, thinking of the sun and happy times! What a fun pack! Love the colors and names. Super creative and fitting. The yellow looks good fun, and cheery but not a neon bright. I always love the names that OPI chooses for their colors (and their collections). I am a HUGE Peanuts fan (my first dog–a beagle–was actually named Linus because he always carried his blanket with him everywhere). To be or not to beagle is an adorable name 🙂 LOVE. Everything about this. To Be or Not to Beagle just stands out! Some fun colors. My niece would like them. I loved this movie as a kid and I love that my kids love it. Great nail polish colors too. This is such a fun collection. I love that it has a lot of dark shades, and one bright pop of colour – the yellow! The glitter polish looks amazing as well. When it comes to nail polish I like glitter. I like both Where’s My Blanket??? and To Be or Not to Beagle. The Where’s My Blanket??? is very festive, I would wear it for Halloween, but I think the To Be or Not to Beagle can be worn at any time. Thank you for sharing this post. What fun colours! Love the Peanuts gang! I love all the colors and really like the decals that come with it. These are cute. I love Peanuts anyway but now nail polish. Cool! wow such amazing shades by OPI. i have always liked their collections and they have some amazing fall colors too. i keep buying them as i’m a nail artist. Charlie Brown is one of my favorite cartoons when i was little, I love his friends including snoopy. Its so awesome they have this OPI Collection just in time for Halloween. My favorite lacquer is To Be or Not to Beagle. What a great seasonal collection. I love sparkes. It would be so much fun to get the Little Peanuts mini pack decals and have some fun painting our nails with my daughters. I love the Peanuts cartoons, such classics. I like the Where’s My Blanket polish! Thanks for the review. Another great collection from OPI, not sure they are my colours but my one niece would love them! These colors really do evoke the Peanuts comics strip! I always loved reading it as well as watching the tv specials ( dating myself aren’t I). I love the black and gold, beautiful! that is so cute. Neat idea for a chrisrmas gift. Oh yes, OPI Nail polish never dissapointed!